Can skateboarding unite the world? Last month, a new School opened in Cambodia’s capital - with a difference. Instead of classrooms, lockers and corridors, the new school is home to a 500 square metre open space, peppered with ramps and quarter pipes for the ultimate skate boarding action. Its pupils? Two hundred and forty local children, many girls and children living with disabilities, all enjoying the school’s lively mix of skateboarding and education. Welcome to Skateistan, Phnom Penh. Skateistan - the term was coined informally - was born in 2007 when Australian Oliver Percovich found himself skateboarding along the wartorn alleys of Kabul. “Afghans were fascinated. Both boys and girls wanted to try out the skateboard,” he says, in a TedTalk. “[But] it shocked me to see the role women played in society. They didn’t go to school, have jobs, ride bicycles. All the popular sports were seen as activities for boys. Then I realised skateboarding was a loophole …. After those early impromptu skate classes in the street, combining boys and girls, the very young and the slightly older, Skateistan began running regular sessions at various locations in Kabul, including an orphanage and an abandoned fountain in a neighborhood called Mekroyan. The daily lessons in the empty Soviet-style fountain attracted dozens of local youth, including many street-working children selling trinkets or washing cars nearby. And so Skateistan was born. Today, the non-profit spans four countries and five cities, empowering and educating youth through skateboarding. From the heart of Kabul and Mazar-e-Sharif in Afghanistan, to the busy Central Business District of Johannesburg and Cambodia, Skateistan’s educators and youth leaders help children build the skills and confidence to create a brighter future for themselves and their communities. But it’s not just about providing a bit of skating tuition to some kids and then sending the them back to still difficult lives. In each city, in programs tailored to local needs, students find platforms for self-expression and personal development in the skateparks while in the classrooms, the spirit continues: creative arts are used to teach topics including human rights, cultural studies, nutrition and the environment. The classes give youth the tools to think critically and develop confidence. With what’s left of the day, educators and youth leaders head out with skateboards and sports equipment to engage with local children, providing an hour of recreational activity and introducing kids to the magic of skate. They also develop partnerships with child protection agencies to connect youth and their families with important social services. A Back-to-School is a program to support youth in their pursuit of formal education. 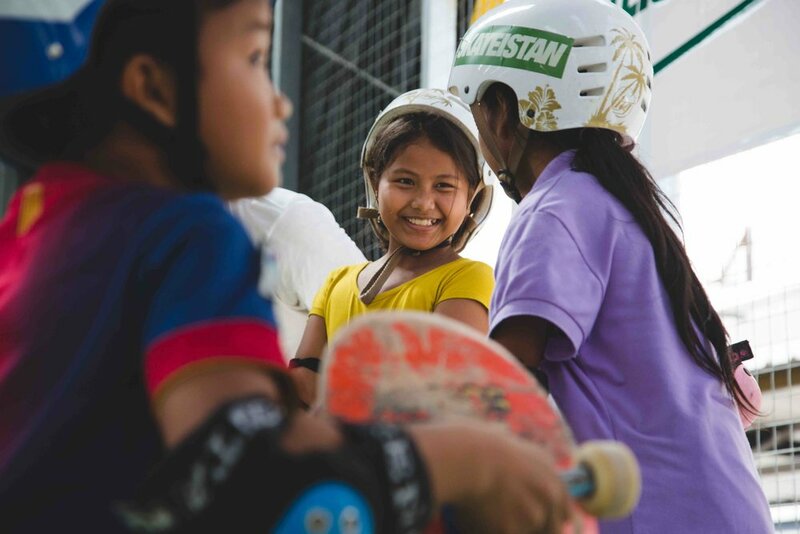 Skateistan’s influences are manifold and unexpected, using skateboarding to build bridges across class and race, across ability and gender, with lessons aimed at building friendships - and with the sheer, physical joy of riding on a board. On its website, students’ quotes give an idea of the scope of joy and inspiration delivered by Skateistan. “At Skateistan, I don’t feel that my surroundings are ruined. I feel as though I’m in a nice place,” says one Skate and Create and Youth Leader in Kabul. “If you are scared, you end up doing nothing and without doing, you cannot achieve anything. But if you do things, all that can happen is you succeed or fail,” says another. Back in Phnom Penh, As soon as ribbons were cut and formalities out the way, over 100 little skater kids took to the 500 square metre space, dropping from ramps and showing off new skills. A pro skate demo by 9-year-old Japanese board prodigy Sky Brown drew whoops and cheers. The excitement is palpable, the laughter infectious. At Skateistan, Phnom Penh, they start as they mean to go on.